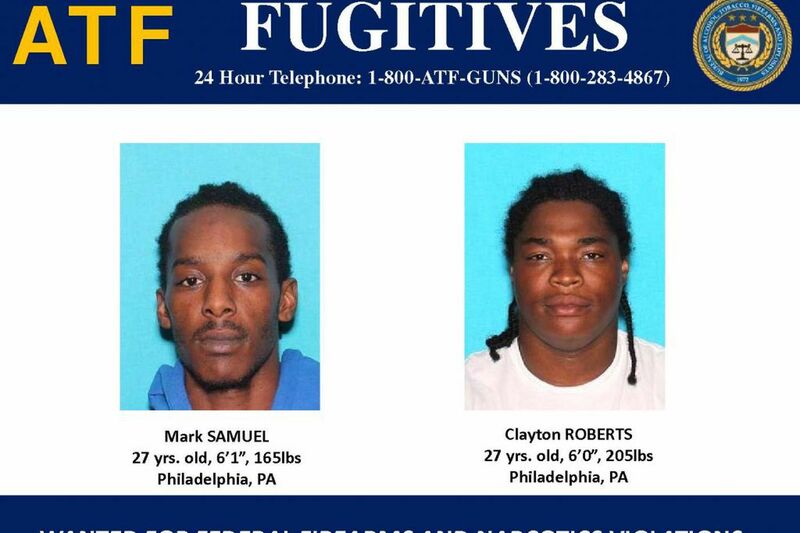 Wanted in federal drug war indictment: Mark Samuel and Clayton Roberts, both of West Philadelphia. Officials announce indictments of 13 men who allegedly were involved in a 2013 war between rival drug gangs in West Philadelphia. From left: Assistant U.S. Attorney John Ortiz; Robert Cekada, acting head of the Bureau of Alcohol, Tobacco, Firearms and Explosives in Philadelphia; Acting U.S. Attorney Louis D. Lappen; Philadelphia Police Deputy Commissioner Dennis Wilson, and Police Inspector James Smith. Like a misshapen hourglass, the West Mill Creek Playground sprawls through several blocks of West Philadelphia: two playgrounds linked by a ballfield. Or, based on a federal indictment unsealed Thursday, two warring countries separated by a demilitarized zone. The U.S. Attorney's Office announced indictments charging 13 men in what they described as a 2013 shooting war by rival drug gangs based at each end of the playground, in which one gang member was killed and four other gang members and a bystander were wounded. "We have two neighborhood playgrounds that should be there for kids and families to enjoy in peace and comfort," said acting U.S. Attorney Louis D. Lappen. "Instead, we have criminal defendants … shooting at each other, dealing crack cocaine, and destroying the quality of life for the citizens of this area." The three indictments by a federal grand jury charged seven members of the "Grounds" gang, based at a playground at 51st Street and Westminster Avenue, and five members of the rival "Pit" gang that operated from the southern playground at 51st and Reno Streets. One other man was individually indicted on a charge of selling 28 grams of crack cocaine to an undercover informant working with the U.S. Bureau of Alcohol, Tobacco, Firearms and Explosives. Lappen said 10 of the 12 men were arrested without incident during an early morning raid Thursday by about 150 ATF agents and Philadelphia police with air support from U.S. Immigration and Customs Enforcement. All those arrested were held after an initial appearance before a federal magistrate judge. Lappen said the investigation was complex and took a long time for federal agents and city police to put together. He declined to elaborate on the size of the drug organizations or the amount of drugs and guns involved. The Pit indictment seeks forfeiture of $500,000 in assets and four semiautomatic pistols. The Grounds indictment seeks $1 million in assets and five semiautomatic pistols. The seven alleged members of the Grounds gang charged in the first indictment were: Robert Mack, 51; Kenneth Riley, 24; James Wilson, 27; Clayton Roberts, 27; Mark Samuel, 27; Xavier Towel, 25; and Sir Robert Keen, 27. Samuel and Roberts were being sought by police. Charged in the Pit indictment were Bryant Calloway, 30; Sean Gilliam, 41; Sean Wilson, 24; Tonie Henderson, 26; and Tyree Johnson, 41. Indicted individually was Marcus Royster, 34, whom Lappen called an associate of the Pit gang. The Grounds indictment has 16 counts charging the seven with conspiracy, drug distribution, and firearms offenses. The Pit indictment is similar except that it has 31 counts and charges Calloway with murder and includes three other drug-related shootings between 2009 and 2013. If convicted, all the defendants face mandatory minimum prison terms ranging from 10 to 30 years to a maximum of life. The indictment alleges a conflict between the two crack-cocaine gangs from about 2009 to 2015. That conflict heated up in the summer of 2013 when Calloway, allegedly a ranking member of the Pits, decided to take over part of the Grounds' turf. The indictment alleges that on Aug. 5, 2013, Calloway and others fatally shot Brian Littles as he was selling crack on Grounds territory. Calloway is the only one identified and charged with murder. That slaying resulted in retribution: On Nov. 22, 2013, Grounds member James Wilson allegedly shot Calloway 10 times. But Calloway survived. Hours later, the indictment alleges, Sean Wilson, a Pit, fired down a residential street into Grounds turf. Lappen said no gang members were hit but one shot wounded a bystander at Westminster Avenue and Paxson Street.